Stockton Wheel Service has been providing specialty wheel and custom wheel services for over 124 years. As specialist in custom wheel repair and widening, our craftsman breathe life back to damaged wheels and make your narrow OEM wheels FAT & TALL. 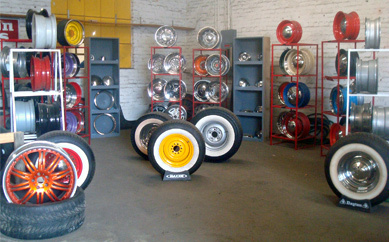 Stockton Wheel carries a full line of new wheels in addition to our custom wheel services. Whether you are looking for a cool set of Nostalgia Wheels for your Hot Rod or a custom set of Industrial Wheels, Stockton Wheel has a wheel for you! Stockton Wheel Service is America's oldest Wheelwright and with age comes a lot of experience. Check our list of most commonly asked questions. If you don't find the answer here, don't hesitate to visit our contact page with your questions. ALSO AVAILABLE: Trailor Running Gear, Front End Suspension and Hot Rod Suspensions. Call for details! CHROME WHEEL EXCHANGE - Are your stock OEM wheels too blah? Send us your vanilla OEM wheels and we'll sprinkle some wheel magic on them! Many great OEM options are available. High Quality Show Chrome. DO YOU NEED SPECIALTY WHEELS? Are you headed out? Way out? SWS can help you with your adventure. SWS has built wheels for many special projects. SWS is up to the challenge. TIRED OF RUNNING TUBE, SPLIT RIMS? Let the Wheelwrights' at SWS get you changed up to tubeless and disc brake outer. Ditch those tube rims for new tubeless rims that accept modern domestic tire sizes.